The historic Acero charter-schools strike is set to enter its second day Wednesday as teachers plan to hit picket lines at Acero’s campuses by 6:30 a.m., the teachers union said late Tuesday. Then the Chicago Teachers Union will hold a rally at 10 a.m. just before the Chicago Board of Education’s monthly meeting at 42 W. Madison St. Union President Jesse Sharkey plans to discuss the strike during the Chicago Public Schools board meeting at 10:30 a.m., according to a statement released by CTU on Tuesday night. 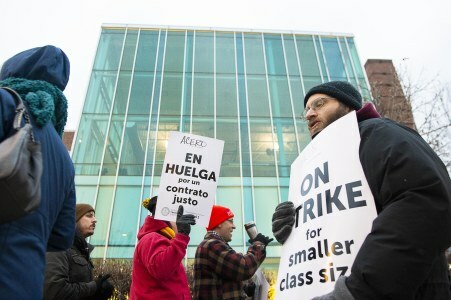 Picket lines stretched two-and-a-half blocks around Acero’s downtown Chicago headquarters at 209 W Jackson Blvd. on Tuesday afternoon as the nation’s first-ever strike by charter school educators canceled classes for thousands of students. Acero teachers who are participating in labor negotiations said Tuesday afternoon that Acero management has refused to make any concessions on their key issues of pay, classroom conditions and sanctuary status for students. First-year teacher Amanda Bright said she left her home state of Ohio to work for Acero schools. Talks between the union and Acero are continuing Tuesday evening, and, according to a teacher who is part of the negotiations, if no agreement is reached, talks will begin again Wednesday morning and teachers will be back on the picket lines. A teacher at the bargaining table says not much progress had been made Tuesday evening. 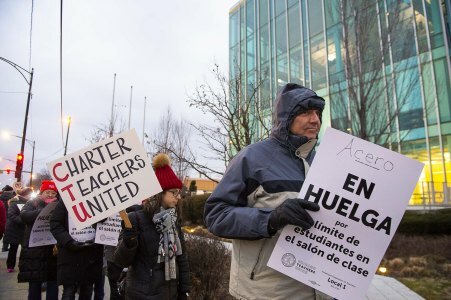 Teachers for the Acero charter schools network began picketing Tuesday morning, shutting down 15 government-funded campuses operated by the privately-managed Acero, which used to be known as the UNO Charter School Network. Acero teachers were bolstered by support from the Chicago Teachers Union and national labor leader Randi Weingarten. 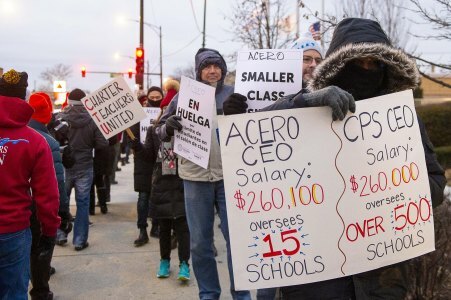 In all, some 550 teachers and paraprofessionals aren’t showing up for classes at one of the largest charter networks in Chicago, forcing Acero’s management to close its doors to the 7,500 students enrolled. Acero leaders encouraged parents to keep their kids at home. The charter network also directed parents to Chicago Park District programs and some YMCA locations. A complete list of school-specific resources was posted on the network’s website. Teachers and support staff started picketing at 6:30 a.m. at Acero’s VMC/Veterans Memorial Campus, 4248 W. 47th St., whose modern building, housing two schools, had gotten the previous charter management into financial trouble. Joining the picket lines was Weingarten, president of the 1.7 million-member American Federation of Teachers, the CTU’s parent organization. Raises offered to educators have amounted to 6 percent over four years, Acero officials said. As charters sprang up and expanded in Chicago, promising innovation and an ability to do better with smaller budgets, they did not employ union teachers on purpose, and as a movement were funded by anti-union organizations that believed teacher unions had too much power. Acero was one of the first charter chains in Chicago to unionize under the CHIACTS union that since has moved under the umbrella of the CTU. And since May, its teachers have been asking Acero’s management team for enhanced special-education resources, sanctuary schools protections, reducing its 32-student class size and better pay, noting that Acero’s CEO is paid about the same $260,000 salary as CPS’ CEO, though he manages 15 schools and she more than 500. Monday’s bargaining session went late into the night, past the midnight strike deadline. Negotiations picked up Tuesday morning at 10. Teachers on the picket lines Tuesday stressed the importance of sanctuary school protections for their students and families, a designation that bars federal agencies like Immigration and Customs Enforcement from entering campus without a court order, warrant or subpoena. Such working conditions for staff are bargainable for charter schools, though not for Chicago Public Schools, union attorney Robert Bloch said. Yecenia Iturve, a fourth-grade teacher at Acero Schools, said this is one of the key issues that forced her to walk off the job Tuesday. Many of her students have openly expressed their anxiety to her about their family’s immigration status. 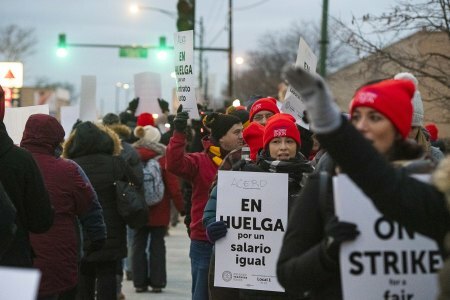 Educators with Acero Schools strike outside Veterans Memorial Charter School Campus, Tuesday, Dec. 4, 2018, in Chicago. | Tyler LaRiviereOver 90 percent of Acero students are Latino. That is why its educators on the picket line are also demanding that Acero campuses become sanctuary schools. “A lot of students are fearful because they know where their parents come from, and they are seeing what is going on around the world,” Iturve said. Martha Baumgarten, a fifth-grade teacher at Acero’s Carlos Fuentes Elementary School, said she understands why students are fearful. In 2016, when Acero was still known as the UNO Charter School Network, its teachers threatened to strike, but reached an agreement in time. 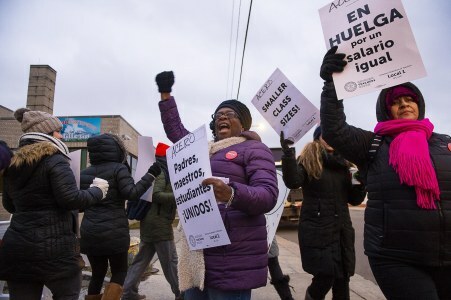 This week’s Acero walkout becomes the second teachers strike under Rahm Emanuel’s tenure as mayor. The CTU walked off the job for seven days in 2012, demanding more pay for Emanuel’s signature longer school day and year. Chicago Public Schools officials emailed parents to clarify that school is in session everywhere but at the Acero schools.